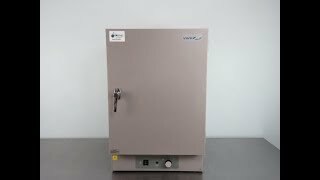 The VWR Sheldon 1515e Incubator is an ideal solution for small capacity incubation needs. This low operation cost incubator heats up in a range between 5° above ambient to 70°C, with low watt density shielded heating elements, with uniformity at ±0.5°C at 37°C. The 2” fiberglass insulation, and gasketed opening help retain heat within this 4-cu ft. capacity laboratory incubator. The glossy white interior of this direct heat incubator makes for easy clean up and the coated wire shelves can be removed without the use of tools. This economy incubator also features a access port for external temperature monitoring. This VWR Sheldon 1515E Incubator has been thoroughly inspected and reached it's max temperature. All of our lab equipment comes backed with our standard warranty. Should you have any questions, please don't hesitate to contact us.